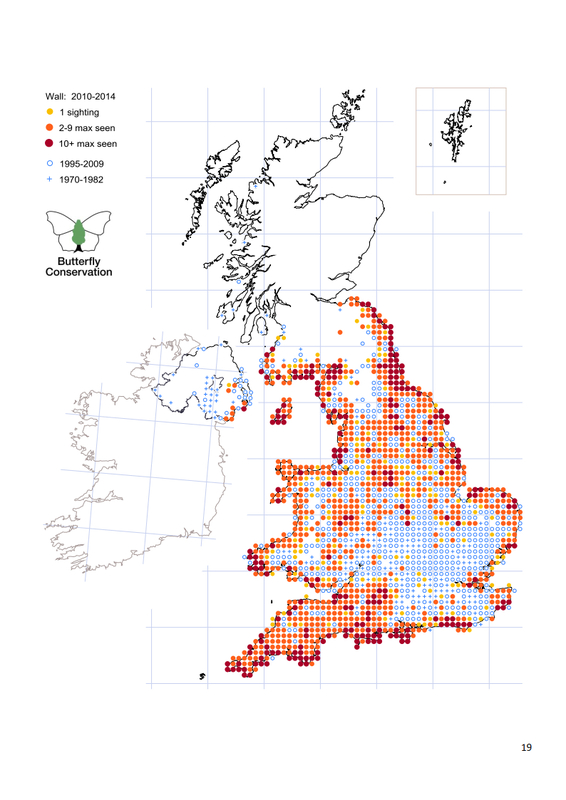 Butterfly Conservation has produced an atlas of UK butterflies. It is not available in paper form but you can view and/or download a PDF version at our downloads page. The Wall map is shown here as an example, click to enlarge the map. 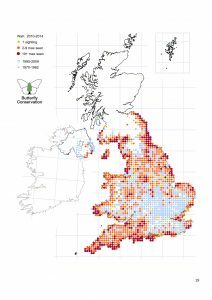 This report presents UK distribution maps for all resident and regular migrant butterfly species (apart from the Large Blue Maculinea arion) based on the most recent five-year survey of the Butterflies for the New Millennium (BNM) recording scheme (2010-2014). The BNM scheme, run by Butterfly Conservation, collates opportunistic sightings of butterflies via a network of expert, volunteer County Recorders. In many areas, records from other recording and monitoring schemes, such as the UK Butterfly Monitoring Scheme, Big Butterfly Count and Garden BirdWatch, are also incorporated following verification. In total, 2.97 million records were amassed during the five-year period. Analysis and interpretation of these data were published in The State of the UK’s Butterflies 2015 report (Fox et al. 2015, available online), but the full set of distribution maps is published here for reference. Maps show the recorded distribution in each 10km x 10km grid square for 2010-2014, as well as historical records where species have been observed in the past but not in the most recent survey.